A bird’s motives are sometimes hard to fathom. Is it breeding or is it feeding; is it feeling aggressive or playful? The male Red-winged Blackbird wears his feelings on his shoulder. The positions of his brilliant red epaulets reveal to us and other redwings whether he is looking for a mate or already has one; whether he is on his territory or is feeding socially. A flash of color, an angle of a shoulder, a thin line of yellow feathers: these things tell us so much. The male erects his epaulets and hunches his shoulders forward and lowers and spreads his tail. This dramatic display serves two functions: to defend his territory from other males and to attract females. The epaulets grow more brilliant and conspicuous, and the black plumage more shiny and solid, as a male grows older. Older males secure the highest quality territories and the fittest mates. In experiments, males with blackened epaulets often lose their territories. When displaying in flight, the male raises his body feathers, especially on the epaulets, and spreads and lowers his tail. He beats his wings slowly and deeply to fly at minimum speed. Males perform this flight display only when above their own territory, usually in response to another male flying over or to an arriving female. 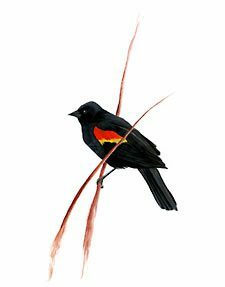 When a male perches on a cattail, reed, or twig in his territory, he usually shows the red and yellow epaulets even when not displaying. Blackbirds perching outside their territory tend to show much less of the epaulet. Red-winged Blackbird chasing a crow. 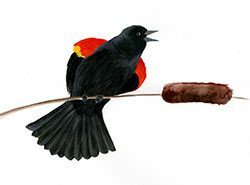 Even during the height of the breeding season, Red-winged Blackbirds forage in flocks on neutral territory. In order to eat peacefully together while avoiding provoking aggressive responses, males hide their epaulets as much as possible, usually showing little more than a thin line of yellow. 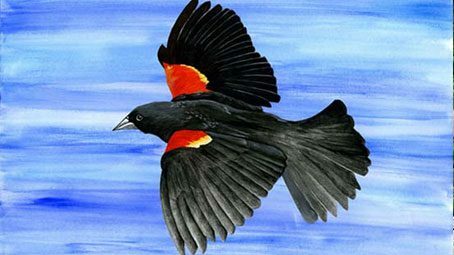 Red-winged Blackbirds often try to drive potential predators, such as crows and hawks, away from the airspace above their nesting territories. A pursuing blackbird stays above and behind the bigger bird, out of reach of beak or claw. Unlike when performing a flight display, when a blackbird flies at his slowest speed, a blackbird chasing a crow or hawk matches his speed to the intruder.